The value of Augmented Reality applications has been shown for a number of different tasks. Most of these show that AR applications add to the immersiveness of an experience. 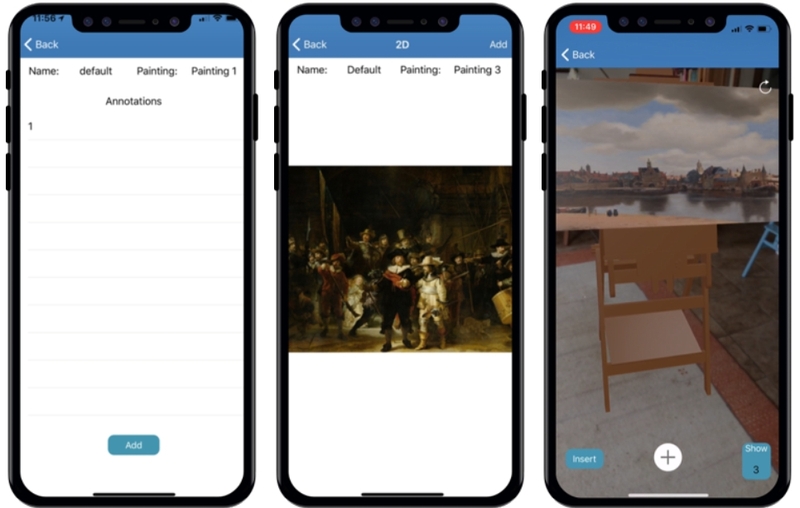 For his Bachelor Project, VU student Jurjen Braam researched to what extent AR technology makes sense for the task of annotating artworks. To this end, Jurjen built a mobile application which allows experts or laypeople to add textual annotations to artworks in three different modes. 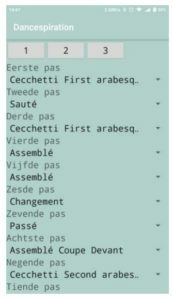 One mode doesnt show the artwork, but allows for textual input, the 2nd mode shows the work in an image and allows for localised annotations. The last mode is the AR mode, which projects the artwork in the physical space, using the device camera and screen. Jurjen evaluated the three modes through a small user study, which showed that immersion and enjoyment was highest in the AR mode but that this mode was least efficient. Also, participants indicated that for annotation tasks, larger screens would be preferable. This research was a unique endeavour combining a proven technology (AR) and well-known task (Annotation) which identified interesting possibilities for follow-up research. 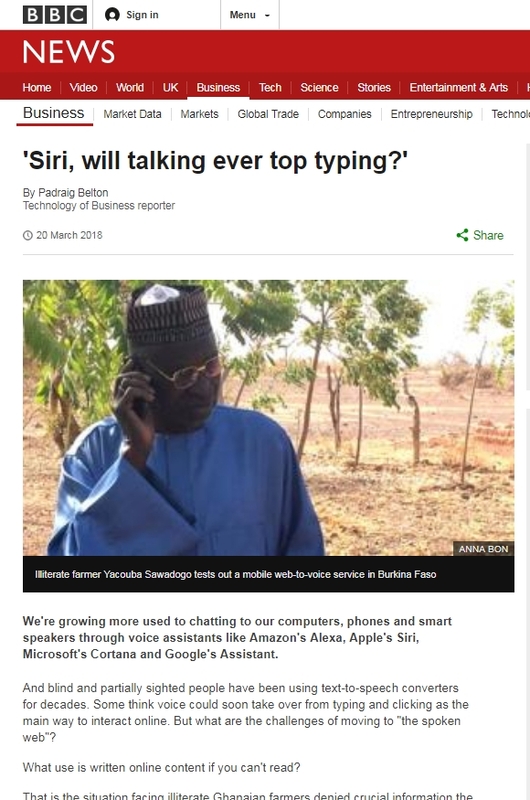 A BBC web article “‘Siri, will talking ever top typing?’ By Padraig Belton features our W4RA work done on voice interfaces for farmer information in Northern Ghana. Francis Dittoh talks about the need for specific information for farmers in their own language and discusses ongoing research into our Kasadaka system. Anna Bon talks more about the web of voices. 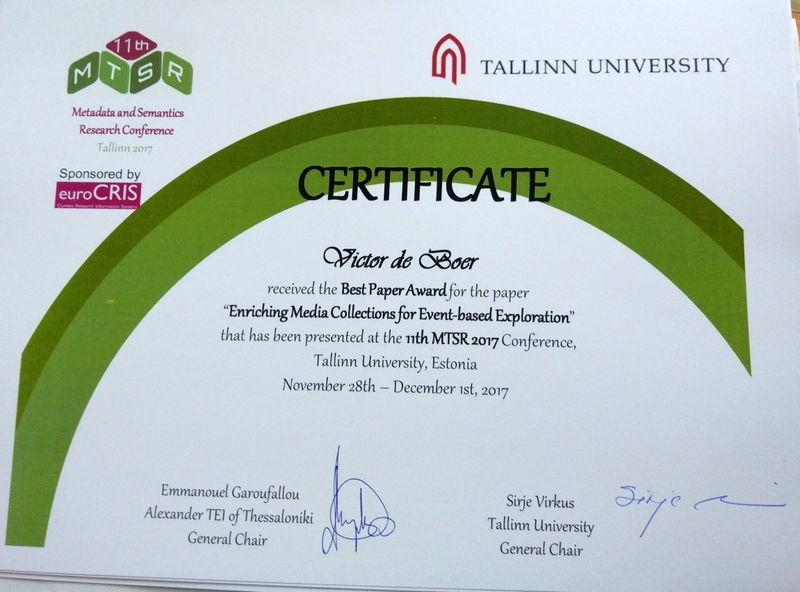 Very nice to see our work recognized by international media! 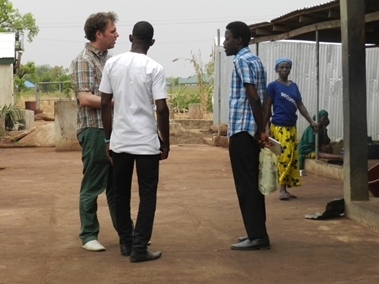 As part of the ongoing W4RA efforts, the VU ICT4D team visited West-Africa once more. This time, we visited Mali, Burkina Faso and Ghana. 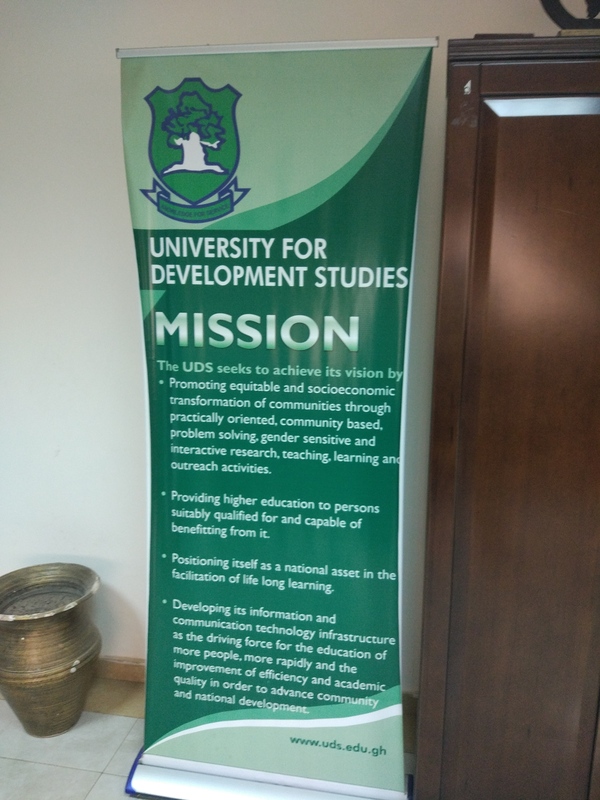 I personally went to Ghana to talk to external PhD candidate Francis Dittoh and his colleagues at the University of Development Studies (UDS) and the SARI institute in Tamale, in Northern Ghana. After first flying to Accra, I first was able to have a short meeting with my good friend Nana Baah Gyan, who is now an ICT for Development expert in that city. I then flew to Tamale,. where we met up with Francis to talk about his PhD work on information systems for rural farmers. After colleagues Anna Bon and Hans Akkermans arrived from Burkina Faso, we met with UDS vice-chancellor as well as the Dean of the Faculty of Engineering to discuss the ongoing collaboration of W4RA and VU with Prof Saa Dittoh, and Francis. We hope to formalize these collaborations in a Memorandum of Understanding between the two universities. We also discuss the ambition of UDS to set up a curriculum in software engineering as part of the undergraduate programs. Such a programme would include a yearly community service courses, where students go into the field. This is very interesting for us as it aligns well with the goals of the ICT4D course at VU. 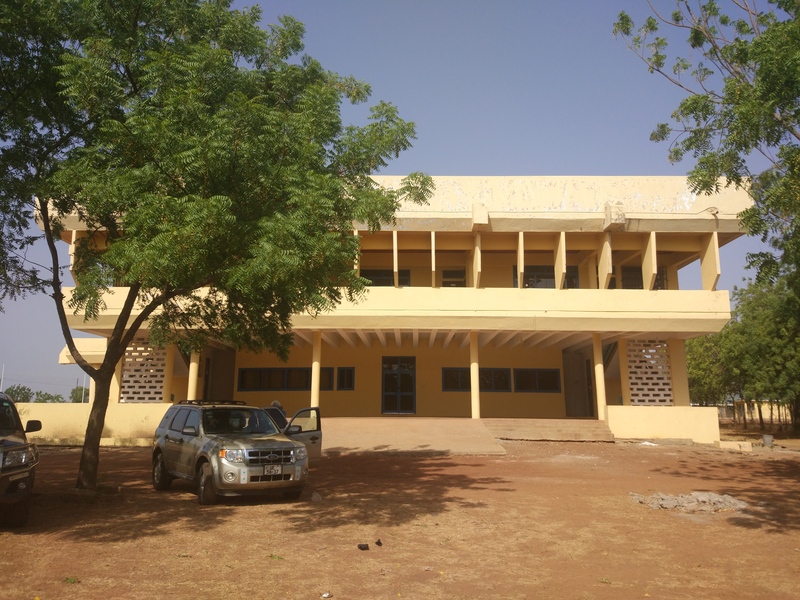 The programmes also include a French language course to allow for smoother cooperation with other Sahel countries (specifically Burkina Faso). We also visited the Savanna Agriculture Research Institute (CSIR-SARI). The situation is comparable to that in Burkina. SARI governs the use of hybrid seeds, which cannot be reused year by year but result in a higher yield. SARI is interested in educating farmers on how to handle these seeds (fertilization, planting etc). There are three classes of seeds: 1) breeder seeds – grown at research institutes, 2) foundation seeds and 3) certified seeds – produced by ~1000 farmers monitored by ~10 seed companies, and certified by an external agency. Potentially interesting for us is their connection to rural farmers. SARI now mostly does this through extension workers from the ministry of Agriculture. 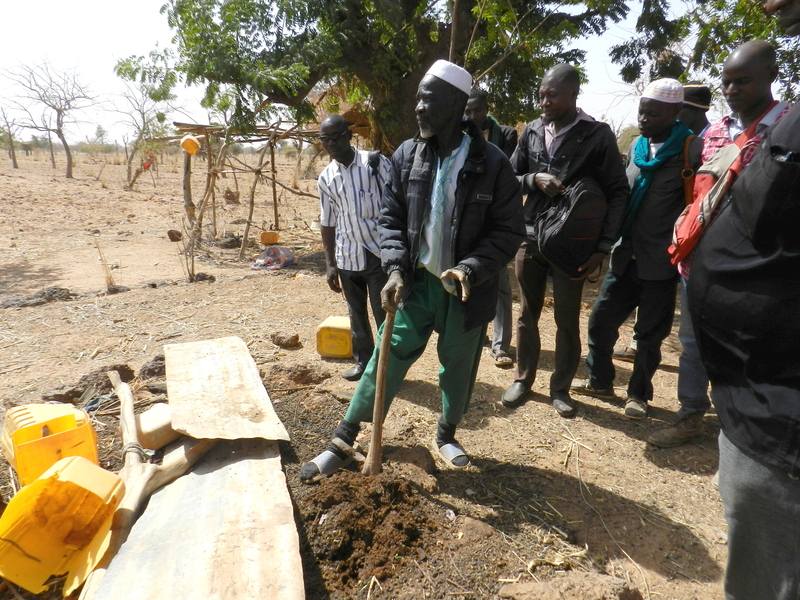 However, because of budget cuts, these are now reduced to roughly 1 extension worker to 2,500 farmers. Therefore, SARI is open to the idea of commucating with farmers directly, for example through a voice-based system. An interesting opportunity could be two-track strategy with a smartphone app for extension workers to allow them to do their work better and a companion voice app for farmers. SARI is very much interested in developing applications in a co-creation process. This would match the research proposal that Francis has submitted to SARI and UDS. A personal highlight was the 10hr road trip that Francis offered me to join instead of taking a flight back to Accra. Ghana is a beautiful country that changes before your eyes on such a trip. My sincere hope is that the proposed collaborations will lead to many more visits to this great country. While the internet usage in the developing world is still low, the adoption of simple mobile phones is widespread. A way to offer the advantages of the internet to these populations is voice-based information systems. The KasaDaka voice-services platform is aimed at providing voice-services in the context of ICT for Development (ICT4D). 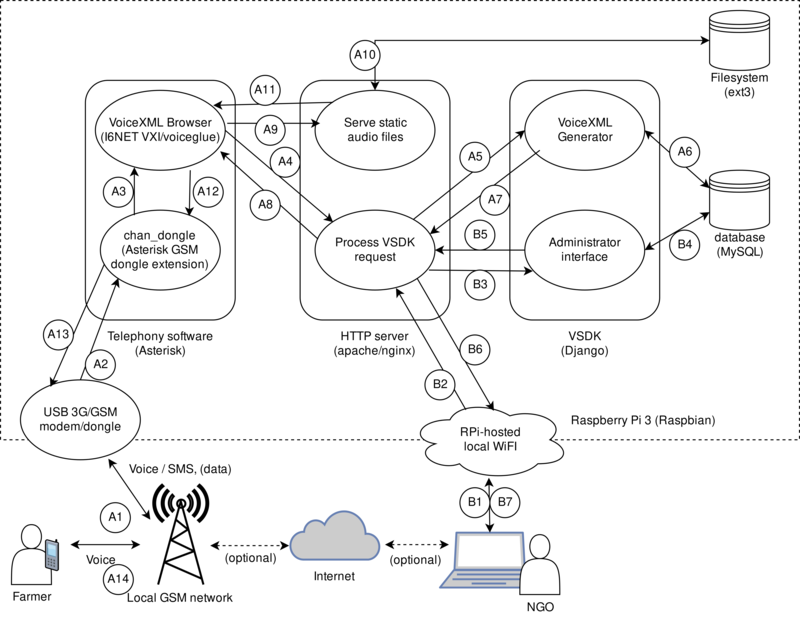 The platform is based on a Raspberry Pi and a GSM modem, which enables affordable voice-service hosting, using the locally available GSM network. The platform takes into account the special requirements of the ICT4D context, such as limited internet connectivity and low literacy rates. This research focuses on lowering the barrier to entry of voice-service development, by reducing the skill set needed to do so. A Voice Service Development Kit (VSDK) is developed that allows the development of voice-services by deploying and customizing provided building-blocks. These building blocks each represent a type of interaction that is often found in voice-services. (for example a menu, user voice input or the playback of a message) The researcher argues that the simplification of voice-service development is an essential step towards sustainable voice-services in the ICT4D context; As this increases the potential number of local voice-service developers, hremoving the dependency on foreign (and thus expensive) developers and engineers. This simplification should ideally be achieved by providing a graphical interface to voice-service development. The VSDK was evaluated during the ICT4D course at the Vrije Universiteit Amsterdam, where students built applications for various ICT4D use-cases using the VSDK. Afterwards a survey was conducted, which provided insight on the students’ experiences with voice-service development and the VSDK. From the results of the evaluation is concluded that the building-block approach to voice-service development used in the VSDK, is successful for the development of simple voice-services. 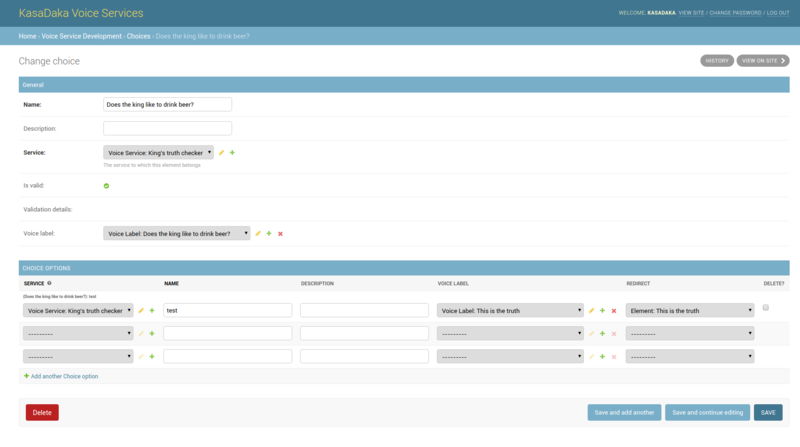 It allows newcomers to (voice-service) development, to quickly develop (simple) voice-services from a graphical interface, without requiring programming experience. The VSDK combined with the existing KasaDaka platform provides a good solution to the hosting and development of voice-services in the ICT4D context. Contextual constraints (lack of infrastructure, low-literacy etc.) play an important role in ICT for Development (ICT4D) projects. The Kasadaka project offers a technological platform for knowledge sharing applications in rural areas in Sub-Saharan Africa. However, lack of stable internet connections restrict exchange of data between distributed Kasadaka instances, which leads us to research alternative ways of machine-to-machine (m2m) communication. Fahad Ali’s research focuses on mobile elements and using wifi sneakernets for this m2m to enable information sharing between geographically distributed devices. 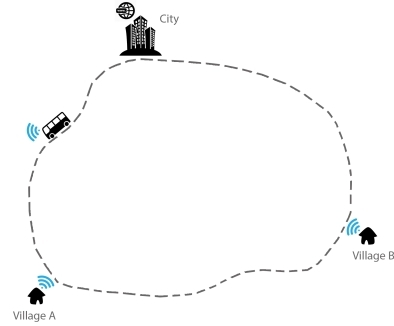 He developed a Raspberry Pi-based device called the Wifi-donkey that can be mounted on a vehicle and facilitates information exchange with nearby devices, using the built-in wifi card of the rPi 3.The solution is based on Piratebox offline file-sharing and communications system built with free software and uses off-the-shelf Linux software components and configuration settings to allow it to discover and connect to nearby Kasadaka devices based using Wifi technologies. 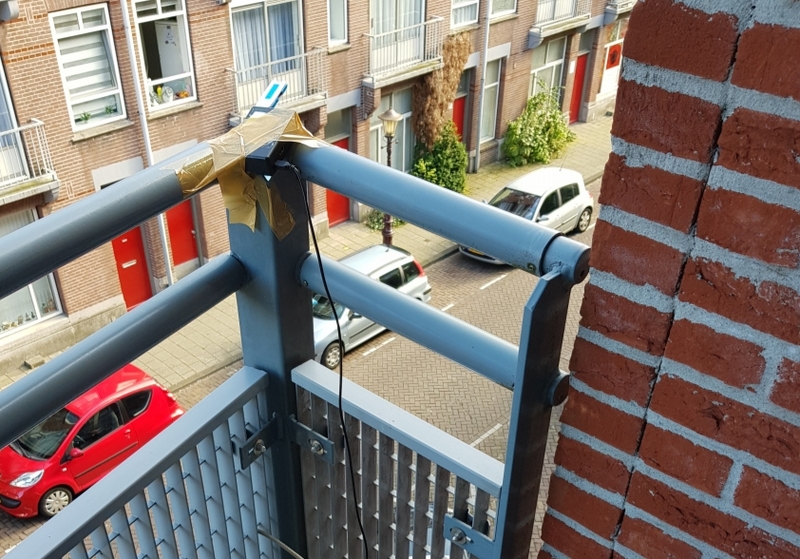 Experimental setup: the wifi-donkey taped to an Amsterdam balcony to test range and bandwith. We evaluated the solution by simulating a low resource setting and testing it by performing so-called “pass-bys” in an Amsterdam residential area. In these cases, SPARQL queries are exchanged between host and client devices and we measure amount of RDF triples transferred. This setup matches earlier case requirements as described in Onno Valkering’s work.Results show that the system works fairly reliably in the simulated setting. The machine-to-machine communication method can be used in various ICT4D projects that require some sort of data sharing functionality. This post describes the MSc theses of Ana-Liza Tjon-a-Pauw and Josien Jansen. As a semantic web researcher, it is hard to sometimes not see ontologies and triples in aspects of my private life. In this case, through my contacts with dancers and choreographers, I have since a long time been interested in exploring knowledge representation for dance. After a few failed attempts to get a research project funded, I decided to let enthusiastic MSc. students have a go to continue with this exploration. This year, two Information Sciences students, Josien Jansen and Ana-Liza Tjon-a-Pauw, were willing to take up this challenge, with great success. With their background as dancers they did not only have the necessary background knowledge at but also access to dancers who could act as study and test subjects. The questions of the two projects was therefore: 1) How can we model and represent dance in a sensible manner so that computers can make sense of choreographs and 2) How can we communicate those choreographies to the dancers? Josien’s thesis addressed this first question. Investigating to what extent choreographers can be supported by semi-automatic analysis of choreographies through the generation of new creative choreography elements. She conducted an online questionnaire among 54 choreographers. The results show that a significant subgroup is willing to use an automatic choreography assistant in their creative process. She further identified requirements for such an assistant, including the semantic levels at which should operate and communicate with the end-users. The requirements are used for a design of a choreography assistant “Dancepiration”, which we implemented as a mobile application. The tool allows choreographers to enter (parts of) a choreography and uses multiple strategies for generating creative variations in three dance styles. Josien evaluated the tool in a user study where we test a) random variations and b) variations based on semantic distance in a dance ontology. The results show that this latter variant is better received by participants. We furthermore identify many differences between the varying dance styles to what extent the assistant supports creativity. Four participants during the 2nd user experiment. From left to right this shows variations presented through textual, 2D animation, 3D animation, and auditory instructions. In her thesis, Ana-Liza dove deeper into the human-computer interaction side of the story. Where Josien had classical ballet and modern dance as background and focus, Ana-Liza looked at Dancehall and Hip-Hop dance styles. For her project, Ana-Liza developed four prototypes that could communicate pieces of computer-generated choreography to dancers through Textual Descriptions, 2-D Animations, 3-D Animations, and Audio Descriptions. Each of these presentation methods has its own advantages and disadvantages, so Ana-Liza made an extensive user survey with seven domain experts (dancers). Despite the relatively small group of users, there was a clear preference for the 3-D animations. Based on the results, Ana-Liza also designed an interactive choreography assistant (IDCAT). The combined theses formed the basis of a scientific article on dance representation and communication that was accepted for publication in the renowned ACE entertainment conference, co-authored by us and co-supervisor Frank Nack. VU’s Network Institute has a yearly Academy Assistant programme where small interdisciplinary research projects are funded. Within these projects, Master students from different disciplines are given the opportunity to work on these projects under supervision of VU staff members. 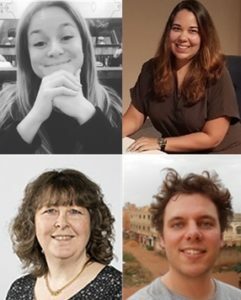 As in previous years, this year, I also participate as a supervisor in one of these projects, in collaboration with Petra Bos from the Applied Linguistics department. 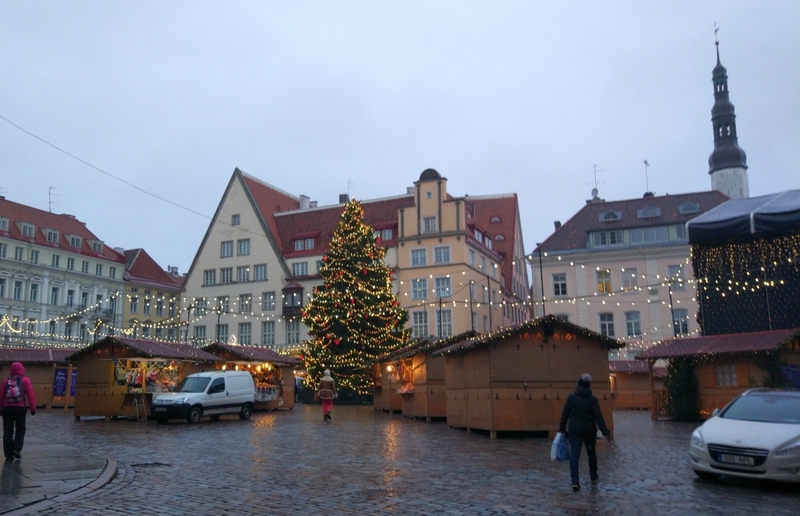 And after having found two enthusiastic students: Dana Hakman from Information Science and Cerise Muller from Applied Linguistics, the project has just started. Our project “ABC-Kb: A Knowledge base supporting the Assessment of language impairment in Bilingual Children” is aimed at supporting language therapists by (re-)structuring information about language development for bilingual children. Speech language therapists and clinical linguists face the challenge of diagnosing children as young as possible, also when their home language is not Dutch. Their achievements on standard (Dutch) language tests will not be reliable indicators for a language impairment. If diagnosticians had access to information on the language development in the Home Language of these children, this would be tremendously helpful in the diagnostic process. This year, I was conference chair of the SEMANTiCS conference, which was held 11-14 Sept in Amsterdam. The conference was in my view a great success, with over 310 visitors across the four days, 24 parallel sessions including academic and industry talks, six keynotes, three awards, many workshops and lots of cups of coffee. I will be posting more looks back soon, but below is a storify item giving an idea of all the cool stuff that happened in the past week.